The Future of Work (I would like to see): the present-future! In this category AI is used to screen applications and resumes, to review and to identify top candidates. 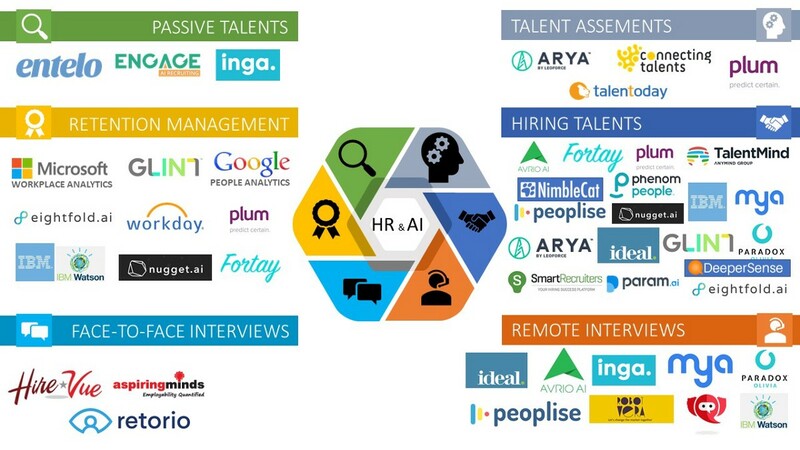 Most of these companies, moreover, use Chatbots and Virtual Assistants to engage talents during the hiring process, keep them informed on their applications and to join them further in case of additional information is needed, or new job positions are available. Some of these companies use AI to harvest social networks to find additional information and to create a more comprehensive profile of the candidates, or to contact the candidates. A Fit-Score, as a statistical distance between the posted job and the candidates, is presented in most of these companies that use different proprietary algorithms. AVRIO: Avrio mission, from their website, is to utilize the power of Artificial Intelligence to unlock human potential to support talent professionals with tools that increase the time for human connection and to creating a transparent, efficient and simplified hiring experience for all. Avrio uses AI with the ability to identify the best candidates for a determined job, based on automatic score, called FitScore while the Chatbot (RIO) can interview the candidate with questions, which are typically included in a phone screening. The Chatbot can suggest salary range using a combination of information including the range set by the employer and the candidate’s social media data. The assistant is also able to describe a typical day on the job to the candidate. IDEAL is a Canadian startup founded in 2013. As reported on their website “Without sacrificing quality for speed, Ideal uses artificial intelligence to analyze rich candidate information such as resumes, chatbot conversations, assessments and performance data. Combining this knowledge with automation, Ideal slashes turnover reduces bias and dramatically improves quality of hire.” Ideal provides different products AI enabled like Automated Resume Screening, Chatbot and Candidate Messaging Software to eliminate phone screens and improve candidate experience, plus a service called “Uncover Your Existing Talent” able to re-screen users’ piles of resumes to find the best talent for clients’ new needs. Ideal uses chatbots, virtual assistant and AI technologies to screen resumes and interview candidates with a 71% reduction costs per hire. Ideal reported, also, to be in the top 10 in Top Retail Employer Brand lists. Glint uses AI tools to help companies save money and provide a better work experience. Machine learning tools help HR and management personnel hire new team members by tracking a candidate’s journey throughout the interview process and maintaining speed up the process of getting streamlined feedback to applicants. Plus, Glint helps HR to retain their employees through the full employee lifecycle. Linkedin acquired Glint on October 2018. Paradox Olivia: Virtual assistants are increasingly common applications of Artificial Intelligence and often vary in their quality and ability to deliver results. Talent acquisition is no exception, and the AI company is attempting to bring value to users through its AI assistant called Olivia. Olivia follows the general format of a chatbot (as depicted in the image below) and reportedly engages with potential candidates by handling tasks such as interview scheduling and responding to general inquiries regarding the company or position. Peoplise is another solution for helping companies calculate a fit-score for new talent, combining such tools as digital screening and online interview results to help to hire managers to arrive at decisions. Peoplise also integrates a Career chatbot. NimbleCat has a Talent Discovery service to help companies to finds high-value talent across the web, a fit-score (Talent Search) shortlisting the highest value candidates. Talent Analytics tells who is in user’s talent pool; guides outbound spend and measures the ROI of one’s efforts. Moreover, if recruiters are already running hard, Talent Direct enables to leverage its team of veteran recruiters to deliver high-value candidates directly to the client. Additional examples for onboarding using Chatbots are Moon, AIDA from Cemex, and more will come soon in the next months.